During the last 25 years Carsten Hellpap has worked at GTZ now Deutsche Gesellschaft für Internationale Zusammenarbeit (GIZ), and presently is the manager of the International Partnership Programme “Energising Development (EnDev)”. EnDev is implementing projects in 25 countries with the objective to facilitate access to affordable, reliable, sustainable, and modern energy. By end of 2016, more than 17 million people got access to modern energy as a result of the global EnDev programme. 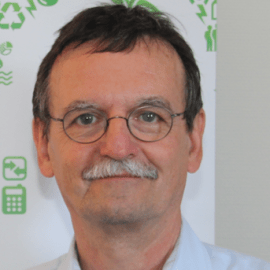 Prior to EnDev, he had been the head of the German Appropriate Technology and Ecoefficiency programme (GATE). As part of his work, he has been actively involved in the introduction and dissemination of different types of technologies in developing countries, considering economic, environmental and social factors. He has authored or co-authored more than 40 publications and papers on technological, environmental and agricultural issues and has been overseeing the compilation and dissemination of training materials and manuals. He carried out several training programmes for international organizations and has been lecturer about different issues of international cooperation at the University of Darmstadt for seven years.